Weather-wise, we’ve had a crazy winter in the United States. At one point this past year, 49 of 50 U.S. states had snow on the ground. And it keeps coming, with 20″ of snow thus far in Chicago, 37″ in Philadelphia, and a ridiculous 56″ in New York. Municipalities fight snow with plows, dirt, laws requiring land owners to shovel their sidewalks, salt, and flamethrowers. Yes, flamethrowers. Well, kind of. 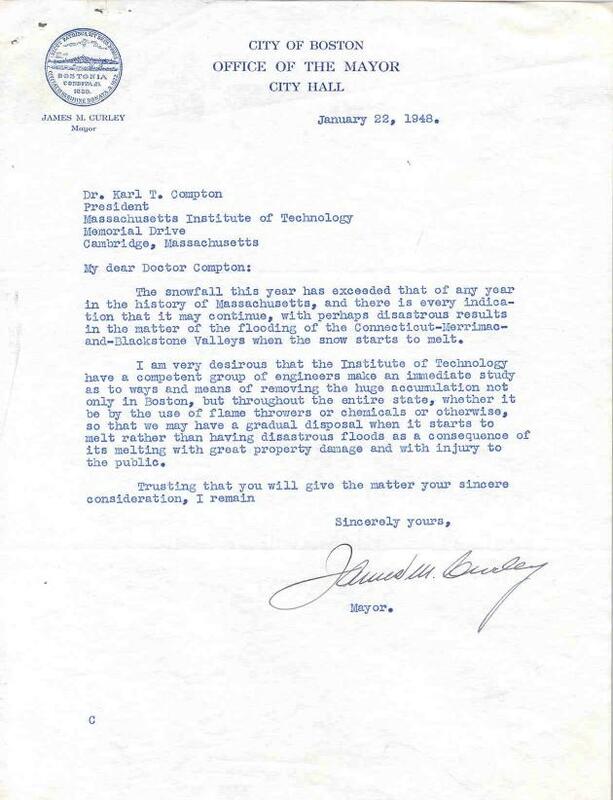 In 1948, the mayor of Boston, James M. Curley, wrote a letter (pictured above; bigger, legibile version here) to the president of M.I.T., asking the university to look into effective, out-of-the-box methods for the removal of the “huge accumulation” of snow in the area. Mr. Curley suggested a starting point: “be it by the use of flame throwers or chemicals or otherwise.” And M.I.T. did, indeed, look into it. By reply phone call a few days later, Karl T. Compton, then M.I.T.’s president, advised against the use of flamethrowers. How do we know? Because he, too, drafted a letter (scroll down) which he never sent. He argued that the use of flamethrowers in melting snow was ill advised because of practical safety issues, energy efficiency, and the like. But that hasn’t stopped others from trying. In 1961, snow threatened to spoil John F. Kennedy’s inauguration into the Presidency. The forecast was for light snow; reality dumped 8″ of powder onto the ill-prepared District. The Army Corps of Engineers were tasked with solving the problem, and in the end, “the task force employed hundreds of dump trucks, front-end loaders, sanders, plows, rotaries, and even flamethrowers to clear the way.” Success! And, more recently, failure. In 2008, a Boston-area man tried to use a homemade blowtorch to clear ice off his porch. His plan went awry when he instead set his house on fire, causing over $20,000 in damage (and thankfully no injuries). As for 2011? Washington City Paper asked the D.C. National Guard if using flamethrowers to melt snow was an option. Nope, they replied, claiming that they simply have no flamethrowers available. We’re all probably better off. Bonus fact: So, which of the 50 states didn’t have snow? If you guessed Hawaii, you’re wrong. The 50th state gets snow on Mauna Loa and Mauna Kea throughout the winter. The correct answer: Florida. From the Archives: Underground Coal Fires: They just keep burning.